When you need to extract image parts from PDF and then make flipbook or do others by those images under Mac system, the following article will be helpful for you. VeryPDF has software named VeryPDF Advanced PDF Page Cut, by which you can extract useful parts from PDF file by removing the unwanted part. And this software has two versions: Mac version and Window version, so no matter you are Mac user or Window user, there is proper version available for you. Please check more information of this software on homepage, in the following part, let us check how to extract image from PDF file. When downloading this software in Try and Buy website, please download the proper version according to your computer system. Here I will take the Mac version for example. When downloading finishes, there will be .pkg file. Please install this software by double clicking the .pkg file and following installation message. Please launch this software by clicking Finder and then go to Application. Step 2. Extract image from PDF under Mac system. When you launch this software, please click button Open to add PDF file to software interface. Once adding finishes, all the pages of PDF will be shown on software interface. Please go to the page which you need to extract image the click button lines vertically and horizontal to frame the image part area where you need to extract. When you draw lines to the area, please click button Delete pieces to delete part which there is no image. If all the pages are same layout, you can click button Apply to apply the setting to all the pages. Then click button Cut and Save to save all the setting part. Meanwhile here you will be reminded to choose the output folder. A few seconds later, you can check the output PDF file with extracted image part in output folder. 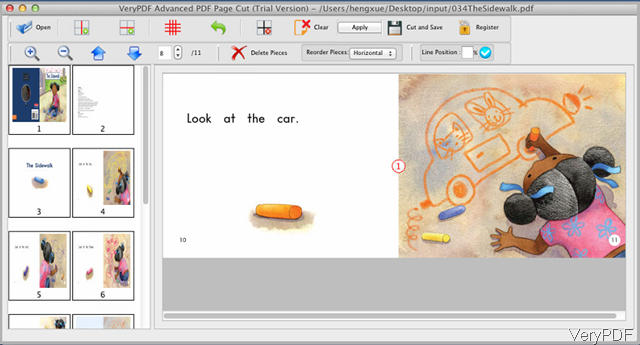 This software can be used to cut different PDF pages with different ways. This software provides three modes to extract image from PDF:auto-mode, manual mode and fine adjust mode. By this software, you can also to cut the unwanted part from PDF file. This software supports all version of PDF files. By the extracted image, you can make flipbook from those images. This software is extremely good when you need to extract image from scanned paper documents. During the using, if you have any question, please contact us as soon as possible. How to convert Html to PDF under Mac OS? This entry was posted in Software for Mac and tagged extract image. Bookmark the permalink.